Last night my wife and I celebrated our thirteenth wedding anniversary, a big milestone that seemed to just sneak up on us in a blink. We asked my mother to come spend the evening with her grandson, and realized that for the first time in a few months, we were going on a date.The realization that we hadn’t taken the time to connect alone in this way was something that also struck a nerve. Nights like this are necessary, and although we have our walks (more on that later), we also need some romantic moments as well. Last year we were still in Malta for our anniversary. 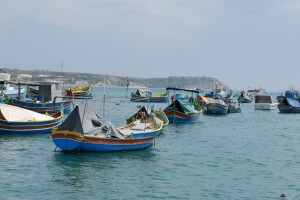 We celebrated with an evening in the beautiful fishing village of Marsaxlokk and a dinner at Tartarun restaurant. For both of us, one of our most magical evenings, as each anniversary should be. We talked as we ate about how lucky we are, what we thought the future would hold, and toasted to the promise of many, many more years together. I remember taking some pictures of the amazing presentation of dishes that came to the table. Tartarun is truly a unique experience, and we wanted to share it with all of our friends as we posted images to Facebook & Twitter. Last night our longitude had changed a bit since we were now back in California. We were enjoying a view of Soquel Creek from the beautiful Shadowbrook Restaurant. It’s hard to imagine that our conversations were any different than the ones we had had 12 times before on other anniversaries. But one thing we did notice this time was people. One couple came in and sat across from us. She wore a simple blouse, ankle length skirt and flats, he was in a polo shirt with pinstripes and old sneakers. The entire time they didn’t say a word to one another, and it almost seemed as if they were regulars. The waiter brought their meal before ours and when he cleared their table, wished them a happy anniversary. They walked out as quietly as they dined. Across the creek were a some younger people enjoying one of the summer creekside rentals. They walked in and out of the wood framed glass doors and stood to look around and take selfies, one had her phone held to her ear for over thirty minutes, and then we looked up from talking to find them gone, obviously headed to the Capitola Esplanade for dinner or drinks. And behind us, out of view, were two couples that talked about money. Well, one couple talked. The other said hardly a word as they carried on about their 10 million dollar estate, how it was being willed to the kids and grands, how they bought their deadbeat son a new car because ‘I’m not about to have him drive my grandchildren around in that piece of junk’ and how their daughter was very upset about how their inheritance was being split, but that she ‘makes three times as much money as our son’. This conversation was one that captivated us, and we just couldn’t stop snickering. The patriarch was an obese man with oxygen tubes feeding into his nostrils and I kept thinking that the kids would be seeing an inheritance fairly soon. Perhaps he sensed the end as much as I did, thus the conversations leaned all night towards what he would be leaving behind. It was sad to me that they talked about their children and grandchildren, but never once did the conversation lead down the path of whether they were happy, fulfilled or loved. All of these experiences really made us think about the ego and how we are always seemingly trying to ‘one-up’ each other. The kids across the way with their selfies, the old couples behind us with their fixations on money, even ourselves with a lot of the pictures that we had taken of our experiences in Malta. We might as well have tagged them all with #andyouarenot at the end of them. Why do we do this? It’s so sad, because most of the time I don’t think we realize we are even doing it. I know that this seems strange to write about, but we both decided last night that social media is really a bizarre thing. That smart phones are so popular in wealthy countries because of the ability to instantly boost an individual’s ego. It’s not often people post things that paint them in a lesser light, probably because those people can’t even afford a smart phone, or have evolved to the point of not having to post every moment of their lives to instagram. One thing my wife and I are going to be doing this year is practice more social responsibility in our daily lives & communities, volunteering even more than we have in the past. We are so grateful for the love and health that are so abundant in our lives. So this time next year we will have a brand new hashtag – what do you think it should be? I love the story and idea of the “and you are not” hashtag. It causes us to reflect on what we do have and how very fortunate we are. You need not change the hashtag to something esle…I think yours if perfect!